The Falklands war of 1982 saw the largest deployment of British Army Special Forces into combat since World War II. 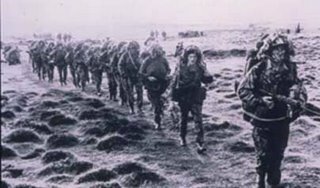 The Special Air Service, the Special Boat Squadron and the Royal Marines Mountain and Arctic Warfare Cadre conducted several spectacular raids during the war. One of the most successful was the attack made by D Squadron SAS against an Argentinean airfield on Pebble Island. Reminiscent of the SAS raids against German and Italian airfields in North Africa during World War II, 11 Argentinean aircraft that posed a serious threat to the British amphibious landings on the Falkland islands were destroyed. It was a classic example of the SAS motto - Who Dares Wins. Four months later, the Argentineans had been comprehensively defeated; they had been fighting for the islands but the British had been fighting for the islanders. Both countries fought as a matter of honor, but honor comes at a high price: 255 British soldiers, sailors and airmen, in addition to over a thousand Argentineans died and there were many more injured.